Service animals come up in almost every property management meeting we have. It's a confusing subject that on the surface, sounds like it should be pretty easily explained. Below you will find some information about what you need to know about service animals. The Federal Fair Housing Act, the Americans with Disabilities Act, the Rehabilitation Act (Section 504), and the Washington State Law Against Discrimination all require that applicants and tenants with disabilities be provided with “reasonable accommodations” as needed in order for them to have an opportunity for full use and enjoyment of their housing. Allowing tenants and their guests who have disabilities to be accompanied by their service animals is a reasonable accommodation to housing policy and practice. These four regulations seem at first glance to be an imposition on landlords and businesses that may, for good reasons, have policies which do not allow pets and animals on their premises. The good reasons, we already know…the possibility of noise, territorial disputes between animals, clean-up problems are the most obvious. But the benefits of these rules should also be considered. There are about 9 million Americans with significant physical and sensory impairments, but there are only 10,000-12,000 assistance dogs, of which 7,000 are guide dogs. When those people with sight or hearing losses, seizure history, unsteady gait or other health conditions have the ability to enter the rental market on a fair basis with other applicants, the pool of potential renters is increased and creates more choice for landlords. And because service animals permit shopping for goods and services out in the community, local businesses reap the financial benefits of the additional customers, in turn helping the entire economy. Many landlords who express that although they had reservations at first, these tenants turned out to be the most responsible renters they had experienced and had the lowest turnover rate. There is a difference between service animals and social animals. Social animals are those used to address animal-assisted therapy goals, and are trained to be used in a wide variety of settings, including hospitals, nursing facilities, schools, and other institutions. And while several national organizations provide structured training and certification programs for social animals, most are not recognized as “service animals” under Federal law. Therefore, social animals are not the subject of this article which addresses only how the laws affect landlords. Who needs a service animal? Some disabled people require the assistance of an animal because of their disabling condition. Under most federal laws, a person is considered to be disabled if s/he has a sensory, mental or physical condition that substantially limits one or more major life activities (walking, seeing, working, etc.). Under Washington law, a disability is a sensory, mental or physical condition that is medically cognizable or diagnosable. What is a service animal? The most common service animals are dogs, but sometimes other species are used (occasionally a cat or bird). Service animals may be any breed, size or weight. Some, but not all, wear special collars and harnesses. Some, but not all, are licensed or certified and/or have identification papers. However, there is no legal requirement for service animals to be visibly identified or to have documentation. The ADA (Americans with Disabilities Act) defines a service animal as “any animal that is individually trained to do work or person tasks for the benefit of a person with a disability.” The Fair Housing Act considers “companion” animals to be a type of service animal; however, they are not always trained to perform tasks. In Washington state, some service animals-in-training are included under the definition of service animal. What’s the difference between a service animal and a pet? Service animals are not considered to be pets. A person with a disability used a service animal as an auxiliary aid – similar to the use of a cane, crutches or wheelchair. For this reason, fair housing laws require that housing providers make modifications to “No Pet” policies to permit the use of a service animal by an individual with a disability. Also, pet fees cannot be charged for service animals. Deposits and Fees As just mentioned, service animal is not a pet and regardless of whether your property allows pets, the disabled tenant who uses a service animal is not required to make a pet deposit or pay a pet-related move-in cleaning fee. You may charge a general cleaning or damage deposit which is charged to all tenants. The tenant is liable for any damage the animal actually causes. Pet rules and “No Pets” rules If you allow tenants to have common household pets and you place limitations on the size, weight, and type of pets allowed, these rules do not apply to service animals. Service animals may be any type of animal and any breed, size or weight, and an accommodation may involve more than one service animal. Service animal accommodation Landlords and property managers must review all requests a disabled tenant makes for reasonable accommodations, including requests for their service animal. You CAN require the tenant to provide written verification from the tenant’s healthcare or mental health provider that the tenant has a disability and needs the service animal. The provider need not be an M.D., but does need to be a healthcare professional. You CAN require proof that the tenant is disabled, but cannot require the tenant to provide information about the specific disability. You can then provide a written response to the tenant, and the IERA has sample letters to use as a general guideline. What do service animals do? Service animals perform many types of services for those with disabilities: A guide animal serves as a travel tool by a person who is legally blind. A hearing animal alerts a person with significant hearing loss or who is deaf when a sound occurs, such as a doorbell, knock on the door, or fire alarm. A service animal helps a person who has a mobility or health disability. Duties may include carrying, fetching, opening doors, ringing doorbells, activating elevator buttons, steadying a person while walking, helping a person up after a fall, etc. A service animal may also be called an assistance animal. A seizure response animal assists a person with a seizure disorder. The animal may go for help, stand guard over the person during the seizure, or activate an alarm to a monitoring service which would then send help. A companion animal or emotional support animal assists people with psychological disabilities. Emotional support animals can help alleviate symptoms such as anxiety, depression, stress and difficulties regarding social interactions, allowing tenants to live independently and fully use their living environment. What about other tenants who are afraid of or allergic to animals? While some people might have fear of dogs or other animals, this fear does not amount to a disability, so a housing provider need not “accommodate” the fear. For most people with allergies, the presence of an animal will cause only minor discomfort, such as sneezing or sniffling and there are many over-the-counter remedies for this. Rarely, a tenant’s allergy is so severe that animal contact may cause respiratory distress; in these cases, the allergic tenant may also request accommodation (for example, to keep the animal in a separate area of the building). Animal care and supervision The tenant/handler has the responsibility to care for and supervise the animal. The tenant must retain full control of the animal at all times. This generally means that while the animal is in common areas, it is on a leash, in a carrier, or otherwise in the direct control of the animal owner/handler. When in the presence of others, the animal is expected to be well behaved, not jumping on or nipping at people, not snarling or barking. You may require that the service animal is in good health, free of internal and external parasites, and fully vaccinated against common diseases (i.e., for dogs – rabies, distemper and parvovirus) and wear a current rabies tag. You may request that immunization records be on file with you. The service animal may be required to wear owner ID tags. Clean-up is the sole responsibility of the owner/handler and you may require that the service animal not defecate in community areas or that it be restricted to a particular area, to be scooped up immediately. Removal of a service animal If a service animal is unruly or disruptive, aggressively jumping on people, nipping, or engaging in other harmful behavior, the landlord or property manager may ask the tenant/handler to remove the animal from the immediate area. if the animal’s improper behavior happens repeatedly, the manager may tell the tenant not to bring the animal into any common area until significant steps have been taken to mitigate the behavior. Mitigation can include refresher training for both the animal and the tenant. Areas off-limits to service animals Management may designate certain areas off limits to service animals, such as swimming in the pool or inside the sauna room. Such designations should not infringe upon the right of a person with disabilities to full enjoyment of the amenities of the community since other persons may be of assistance in the pool or sauna. The service animal may be at poolside and immediately outside the sauna door. Verification of disability and need for a service animal The tenant must provide written verification that s/he has a disability and that the accommodation is necessary to give the tenant equal opportunity to use and enjoy the community. The tenant should obtain a signed letter on professional letterhead from his or her own healthcare or mental health provider to the housing provider answering the following questions: 1) Is the person disabled as defined by the fair housing laws? and 2) In the healthcare provider’s professional opinion, does the person need the requested use of the service animal to have the same opportunity as a non-disabled person to use and enjoy the housing community? Sample letters are available at the IERA office for use only as a guide. This article is not meant to serve as legal advice. For specific circumstances or more in depth, call your legal service provider, or the IERA member attorneys. It’s that time of year! Summer is coming and so is the height of the moving season. Moving is a stressful time for any family, especially if you are having to change school districts. To help you be mindful of your children’s needs in regards to a move, below are some tips to help them ease into the transition without being totally overwhelmed. Inform your kids as early as possible about the move. Talk to them about it frequently to reinforce that it is going to happen. Children will respond to this news in different ways, but the bottom line is that their reaction usually stems from fear. Encourage them to ask questions and be honest with your answers. Involve your children as much as possible when planning the move. Take them with you to look at possible new homes. Once you have decided on a home, let them draw out how they are going to arrange their bedroom furniture, toys, or playroom. Have your child pack their box of their most favorite items and label it. Then, let them unpack it first thing when you get to the new house. These may seem like simple things to do, but they make a huge difference. You should also help your children adjust to their new community and school. Take your children to tour their new school. Inquire about a buddy system for new students and the possibility of meeting their teachers. Take a walk around your neighborhood so your child is familiar with their surroundings. If there is a park nearby, take your children to play and introduce them to the other children in the neighborhood. The best thing you can do for your child once you are settled in is get back to a normal routine. If school isn’t in session, have breakfast, lunch, and dinner at set times. Also, try to set a bedtime routine. And as always, remember tell them you love them. Each of your children will handle a move in their own way. Some kids will see the move as an adventure and adapt quickly, while for others, it can take longer. Just remember, kids are resilient and most will adapt in about two to three months. 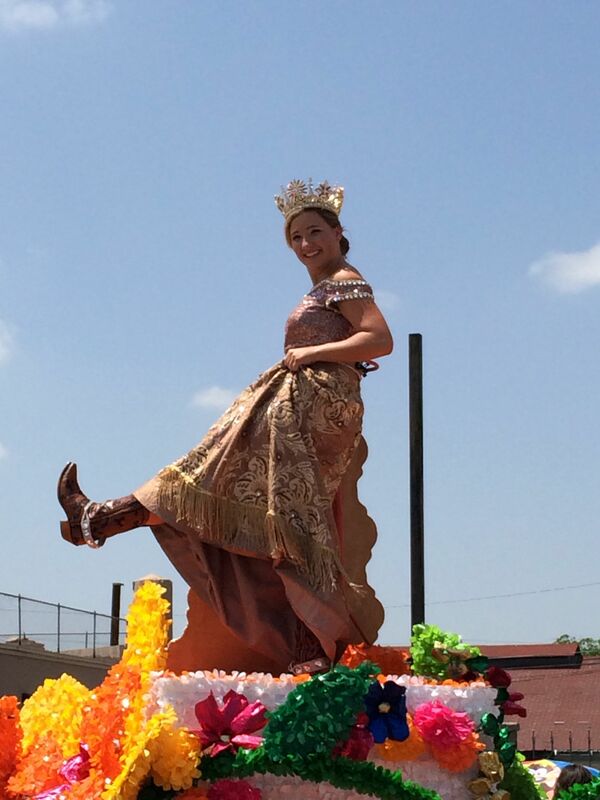 The Battle of the Flowers parade began in the late 19th century and is the highlight event of Fiesta today. Originally, it was intended to be a one day event to pay homage to the Battle of the Alamo and the Battle of San Jacinto. Fiesta is now a city wide event that lasts ten days. In the beginning, 1891, local women decorated buggies and bicycles with live flowers and threw them at each other. This was the beginning of the Battle of the Flowers that has become the annual event. In 1895, the Battle of the Flowers Association began crowning a Carnival Queen; then, in 1909, a full court was established. Today, the signature Battle of the Flowers parade is known for the elaborate dresses and fancy shoes or boots worn by the court contestants. Fiesta has now become a great resource for the city's non-profit organizations by staging over 100 events over ten days with the help of over 75,000 volunteers. There are three parades including a night parade on the River Walk. Other featured events include Oyster Bake, Alamo Heights Night, and NIOSA (A Night in Old San Antonio). If none of these events find your fancy, there are plenty of other events during Fiesta that you might enjoy.